Our instructors are all nationally certified in their area of expertise. And our comfortable, Group Exercise Room offers the perfect environment to reach your fitness goals. Strengthen your muscles, improve your core strength and posture and give your body a lean and toned look. You will use your own body weight for resistance to focus on the thigh and seat muscles. Join us for an intense circuit class that will work every muscle in your body. We’ll move through a variety of body weight exercises designed to build strength and endurance while raising your heart rate. We’ll also incorporate cardio intervals for a full body blast! This class will utilize the Group Exercise Room and the Gymnasium. This is an intense circuit class that will alternate between cardio and weight training while utilizing steps, stability balls, medicine balls, and free weights. This non-stop line dancing class will touch on the latest dances and the classics. You'll have so much fun you won't even realize you're getting a great workout. This low-impact fitness class will challenge your cardiovascular system and strengthen your muscles without putting stress on your joints. This is a unique class that utilizes barbells, steps and rubberized plate weights. This class is low impact and high energy. The focus is on a gradual progression to more challenging exercises. A fitness program designed to empower people with Parkinson’s Disease to take control of the disease with daily exercise. This program is free and open to the public. Funding provided by Mercy Health Foundation. This youth fitness class is specially designed to allow your child to channel their high level of energy into fun fitness activities. Each week we will take part in a different activity, from Drums Alive® to sports geared games, to Yoga. We'll combine fitness and fun to get your little one moving. A gentle approach to yoga for those who can’t work on the floor. Learn the basic principles of proper alignment using classical poses to lengthen and strengthen the body, improve flexibility and reduce stress. Anything goes in this class! Whether the focus is on weights, cardio or a combination of both, this class will leave you feeling fully energized. This Pilates-based class will focus on core strength and stretching. Spend your lunch break building long, lean muscle while gaining flexibility and burning calories. This total-body strength and cardio conditioning class helps you blast fat and build lean muscle fast. You can modify any move and the group motivation will help you push past your plateaus. A non-stop, cardio fusion of standing pilates, boxing and dance that will help you build long, lean muscle while burning maximum calories. 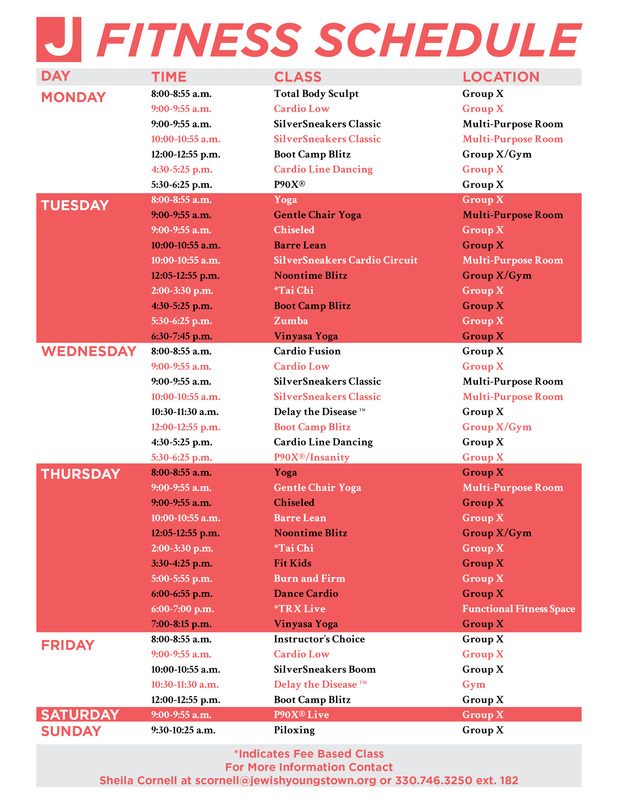 Challenge yourself with a blended fusion of cardio, athletic exercises, yoga and Pilates all in one class! This total body workout will improve strength, flexibility, endurance and balance. Have fun and move to the music through a variety of exercises designed to increase muscular strength, range of motion and activity for daily living skills. Hand-held weights, elastic tubing with handles and a ball are all offered for resistance. A chair is used for seated and/or standing support. Combine fun with fitness to increase your cardiovascular and muscular endurance power with a standing circuit workout. Upper-body strength work with hand-held weights, elastic tubing with handles and a SilverSneakers ball is alternated with non-impact aerobic choreography. A chair is offered for support, stretching and relaxation exercises. An ancient Chinese practice designed to exercise body, mind and spirit. This class will move through Tai Chi postures, gently working the muscles and focusing on concentration, and runs in 4-week sessions. 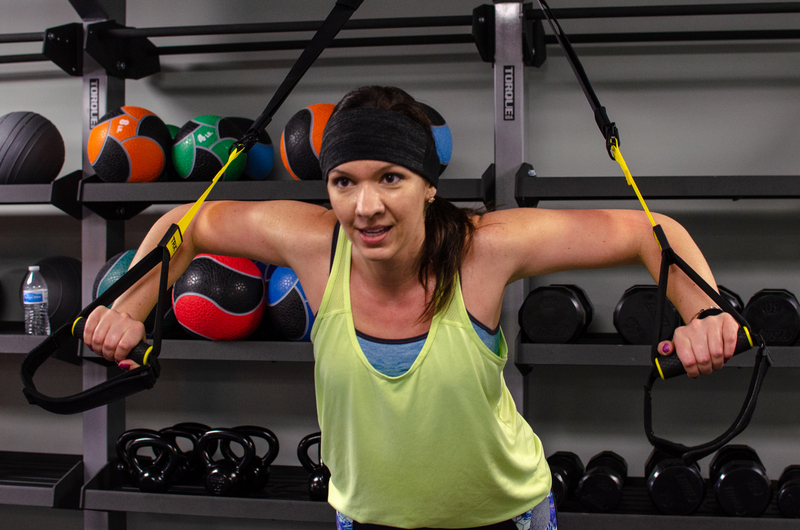 A Suspension Training class that leverages gravity and body weight to develop strength, balance, flexibility and core stability simultaneously. Space is limited to 10 participants per class. This all-over strength workout will utilize barbells, dumbbells, risers, and your own body weight. Build long, lean muscle while burning calories. No weights required. Mixture of cardio and strength exercises utilizing your own body weight. Various modes of training such as pyramids, circuits, and AMRAPS (as many reps as possible) will be used for a high calorie burn! All fitness levels welcome. This is a gentle stretching class for beginner and intermediate students. The emphasis will be on body positioning and breathing that promotes a peaceful connection among your mind, body and spirit. A simple Asana routine including sun salutations, forward bends, balancing poses, hip openers, twists, and more. Dance to an upbeat mix of Salsa, Merengue, Mambo, Hip Hop, Reggaeton, and much more. This class is a party and a huge calorie-burner all in one. This workout incorporates many of the dance/fitness routines of zumba but performed at a lower intensity.